We welcome you to join us immediately afterward for the After Party with the Flying Toasters. Tickets are only $25 and 100% of the sales will benefit the Westfield Youth Assistance Program. Come out to the Westfield Youth Assistance Fall Festival for a fun Free community event for all ages. Want to join us for the After Party Concert Only? 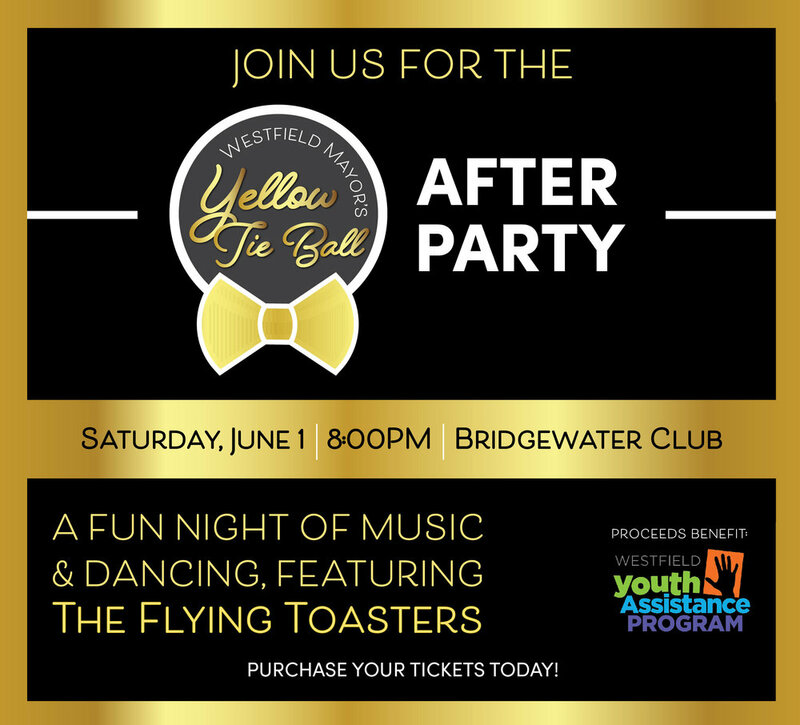 Join us after the Mayor of Westfield’s Yellow Tie Ball for entertainment by The Flying Toasters. The concert will begin at 8:30pm and conclude at 11pm. The Youth Recognition Breakfast began in 2011 as a way to recognize youth in the Westfield Washington School Corporation. The breakfast honors youth in the community who have overcome adversity or tragedy, volunteered numerous hours in the community. Online Registration Below. All registration money to be received by October 1st, 2015 for shirt orders. After submission you will be prompted with a link here to online payment option. There is a $1.50 convenient charge to process. Click on "Pay Here" to complete registration. This Years Mayors Yellow Tie Ball is a Who's Who of Community Involvement. So many great people get together to honor the Westfield Youth and Raise Money for WYA Programs. Enjoy the photograph from the event. Come out and enjoy Faceprinting, Balloons, Tempory Tattoos and All sorts of fun to benefit the Westfield Youth Assistance program. Hosted by First Impressions, Growing Grins and Wittler Dental. The Westfield Youth Assistance Program (WYAP) is a non-profit organization that was established in 2009 that strives to build a healthy community for tomorrow by extending a helping hand to the youth of today through coordination of services, family assistance, tutoring and mentoring. This year we are hosting our 1st Annual Westfield Youth Assistance Family Fun Walk in conjunction with the Americana Bank Fall Festival which benefits WYAP. Start/Finish: Midland Trace Trail on Carey Rd. to Union Street and back to Ameriana Bank. Stroller’s welcome– children must be accompanied by adult – no pets or bicycles please. Parking: Kroger Plaza Parking Lot west of Agave Blu Restaurant.